This is the third in my series of holiday gift guides. The first guide was for infants and toddlers and the second for preschoolers. This guide is for everyone else – including grown-ups. The final list will be for books. This is actually my favorite, albeit most difficult list to put together. Gifts for people in this category are heavily shifted to electronics and software for electronic products. This list includes only the “other stuff.” I also have included some wonderful products that you have never heard of but are sure to be winners. The bonus is that this list also features a super giveaway opportunity. Read to the end to see the simple entry details. This unique guide is from a grandmother’s perspective. It is my HONEST opinion - no corporate PR. I go to toy shows throughout the year and I see thousands of items. Usually I see them out of the box and I may see demonstrations of how they work. The items on this list are those that I think will be enjoyed and you may not hear about them elsewhere. And… many will have cross generational interests. This is how items make it on my lists. The pictures were taken by me at shows - no stock photos. They may be less than perfect with other stuff in the background, but they show the real deal. Women March 500 Piece Round Puzzle by eeboo – Our Giveaway! I am so excited to be able to offer this very special item as a giveaway. And there will be two winners! This has definitely become the “Year of the Woman” and it began on a cold January Day with the Women’s March in Washington, DC and all over the country. To commemorate this event eeboo has produced this stunning 500 piece round puzzle. The quote that surrounds “We are linked, we are not ranked, and this is a day that will change us forever because we are together, each of us individually and collectively will never be the same again” was by Gloria Steinem at the March. This is a gift not only for puzzle lovers but for everyone who appreciates the seismic shift happening in women’s empowerment. It is that unexpected, thoughtful gift you wish you could think of but have no idea what to give. And it is budget friendly! 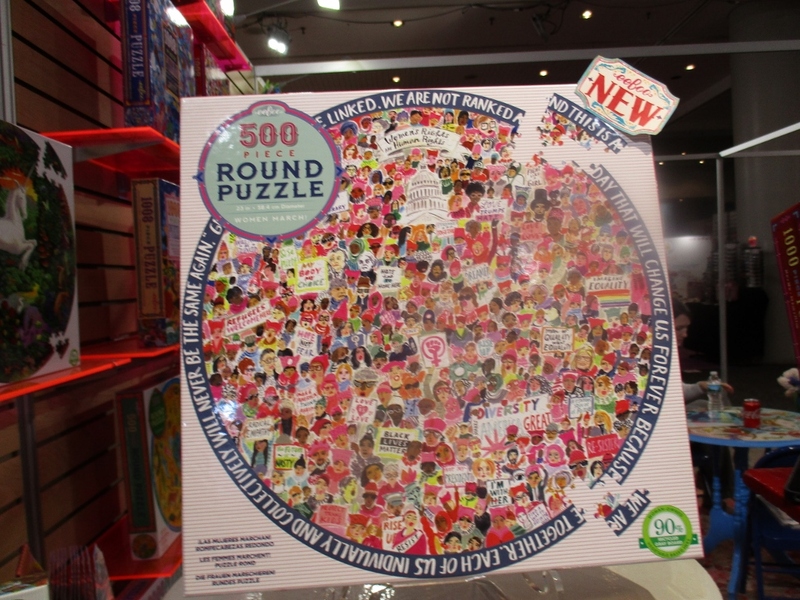 The Women’s March puzzle is a Oppenheim Platinum Toy Award winner that was recently featured on the Today Show. Thames and Kosmos are well known for the science oriented kits. 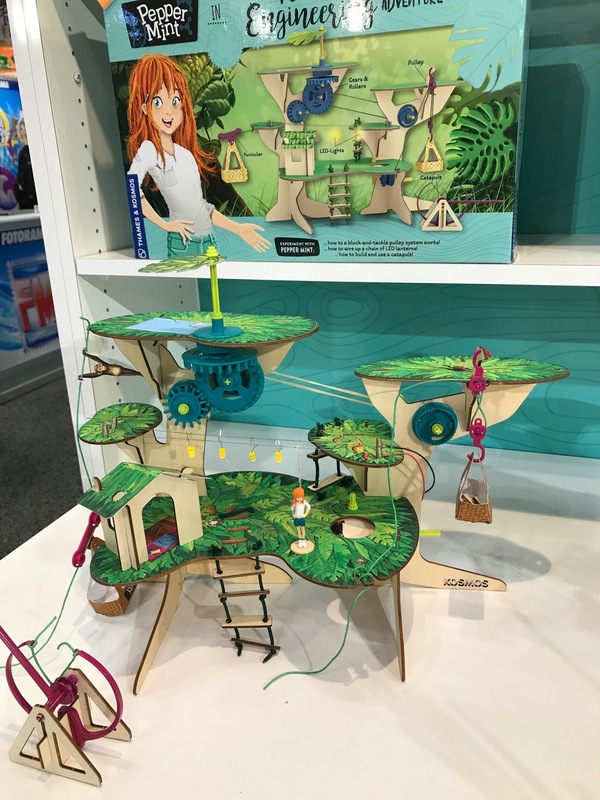 I’m including the best STEM item for girls that I saw this year – Pepper Mint in the Great Treehouse Engineering Adventure - a Toy of the Year finalist. I also recommend the Fantastic Underwater Science Voyage which should appeal to boys and girls. 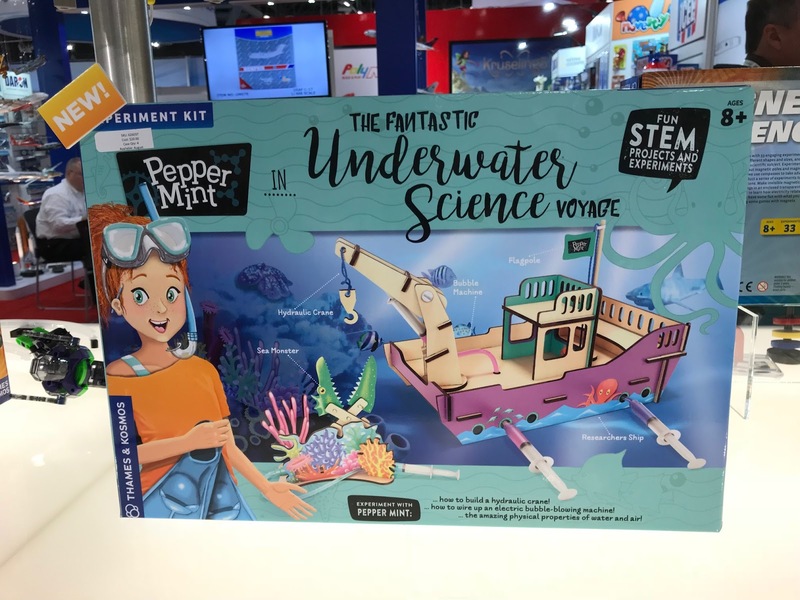 For older kids who are interested science and like to build things, these are both worth checking out. This award winning LEGO set is also on many Holiday Toy lists. If you are interested in this item, buy it today, it easily will be a holiday sellout. Harry Potter continues to be popular with new readers and people of all ages. 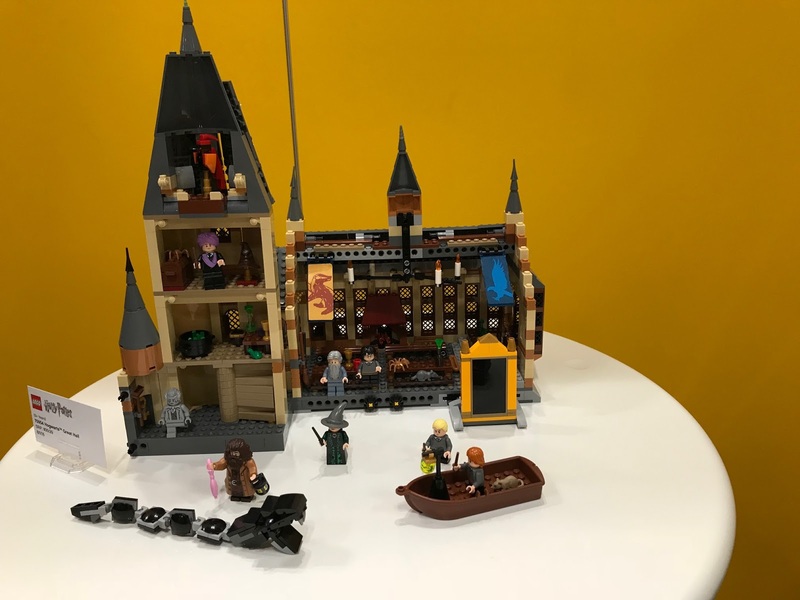 This 878 piece set is a gorgeous, detailed set – something LEGO knows how to do. It features the potions and treasures rooms and the tower has a moveable staircase. Plus a remarkale 10 minifigures – all your favorites! This item can also be a wonderful intergenerational project to put together. Although pricey, I put this in the good value category compared to many items offered in this price range. There is also a more elaborate (6000 pieces) set available for serious LEGO aficionados. 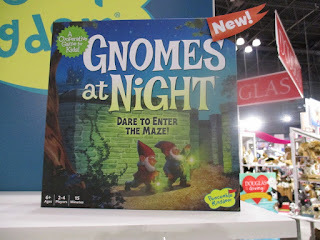 Peaceable Kingdom has cooperative games for children of all ages and this one is designed for older kids. The players must work as a team under time pressure to find the twelve treasures before morning that have been stolen from the Queen. Rather than play against each other, the players work together to find all of the treasures. This is another excellent intergenerational opportunity. This 162 piece 3d Jigsaw puzzle is a great present for Grandpa or the kids. 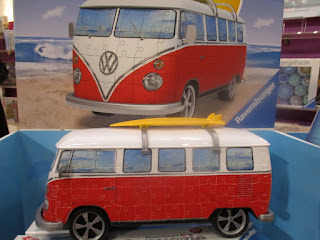 The grandparents vividly remember these and all of the Ravensburger 3D puzzles are fun to put together. I have my eye on this for a Pop and grandson project when my grandson is with us for a sleepover. I can picture some giggles and tales of long ago mixed up together. Can you? 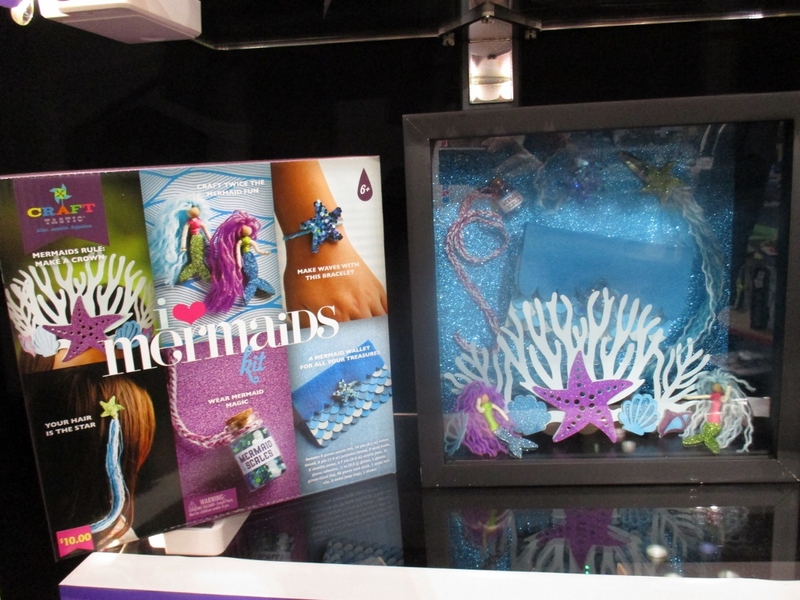 There are six separate mermaid themed craft projects with everything needed included in the kit. This is another good item to have to take out over the winter holiday break or on a cold snowy day. 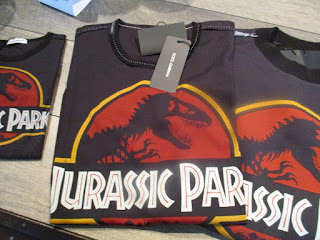 If you know any Jurassic Park super fans – and there are many – you can’t go wrong with this t-shirt. It may get worn immediately. Two winners will receive a Woman's March puzzle by eeboo. The hallmark of The Grandma Chronicles giveaways is that it is easy to enter and there are two ways. Both ways count as an entry so you get two entries if you do both. I need to be able to contact you if you win. If you enter - email your email address to marion@grandmachronicles.com. I will not use your email address for anything except to notify you if you win. Grandmother’s Honor. You can have two entries by doing both. Deadline to enter: Wednesday, December 12, 2018 at midnight. This item can be sent to US addresses only. Full Disclosure: The reviews in this article are my own objective opinion. I did not get paid to write these reviews nor I do I have a sponsorship/ambassador relationship with any of these companies. This is the second in my series of holiday gift guides and this one is specifically for preschoolers. Preschoolers have favorite characters and love to have things associated with them. My two year old granddaughter is not brand sensitive but my three year old grandson loves Lightning McQueen and Paw Patrol. This change happens when we aren’t looking and it definitely affects gift giving. My list for babies and toddlers did not include any character branded types of items but this one does. I also recommend some wonderful products that you have never heard of but are sure to be winners. This list doesn't have any break the bank items but there are a few pricey ones. Sometimes those wind up on the grandparents list. The bonus is that this list also features a giveaway opportunity. Read to the end to see the simple entry details. I go to toys shows throughout the year and I see thousands of toys. Usually I see them out of the box and I may see demonstrations of how they work. 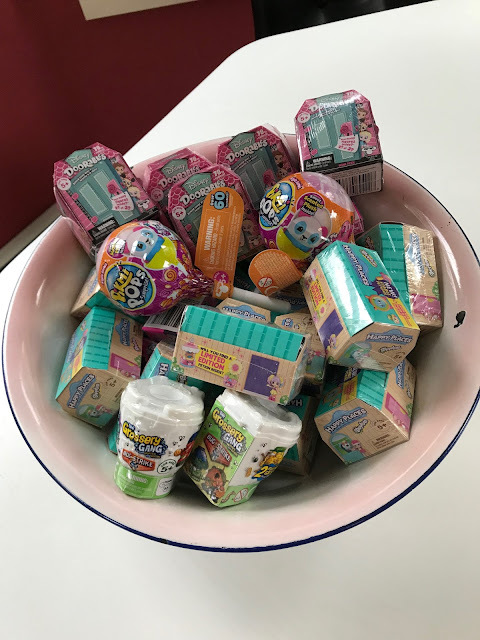 The items on this list are the toys that I think the kids will enjoy. And… there are some that you will enjoy playing with the grandkids. This is how items make it on my lists. Most of these pictures were taken by me at toy shows - not stock photos. They may be less than perfect with other stuff in the background, but they show the real deal. 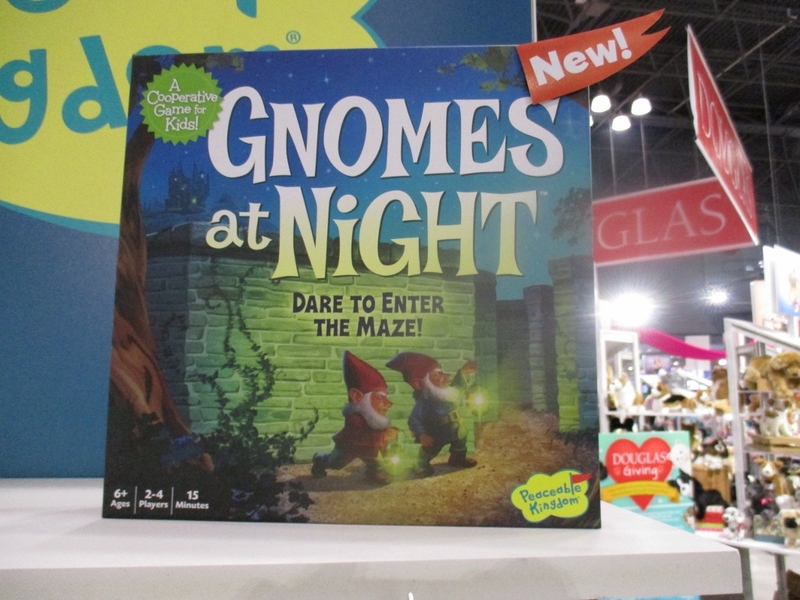 Kids begin to play games once they are preschoolers. The Five Little Fish game is full of developmental activities as well as being fun. Check out this short video to see for yourself. 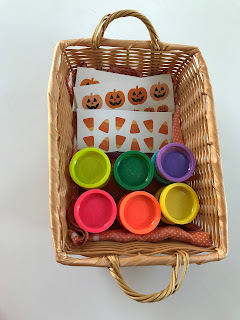 There are many preschool games to choose from. I am delighted to be offering Five Little Fish as a giveaway with this guide. See the end of the article for entry details. 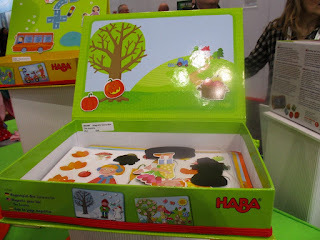 This game box opens up and sturdy magnetic cardboard pieces can be attached to the board to represent the various seasons. 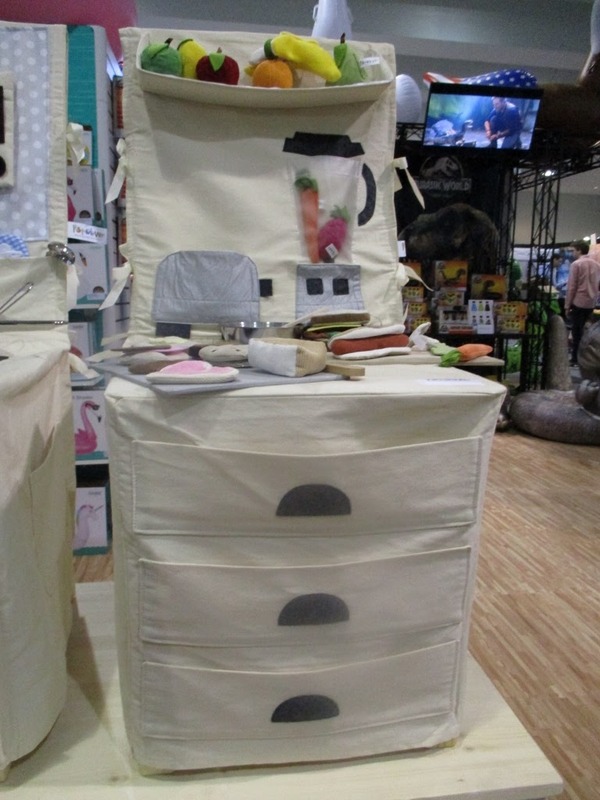 This is a great item for travel or bringing to the grandparent’s house. The box is also a sturdy carrying case. This simple book and craft kit make an excellent grandparent and child activity to do together. Forget the picture – there is no cooking involved. The kit includes a 24 page book, foam gingerbread man and stickers, and finger puppets ready to color. 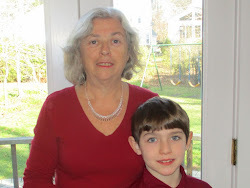 Will you be spending time with young grandchildren over the holidays? This will be be a good item to have in your bag. If this activity is a hit, there are more kits in the series. These toys were my special secret finds at Toy Fair. 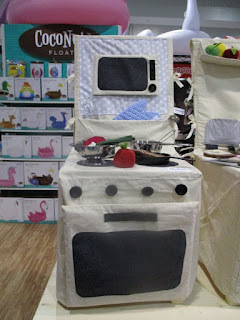 Preschoolers love to play with kitchen sets. However the big plastic and wood sets are costly and take up a lot of room. These cloth kitchen sets fit over an ordinary chair and transform into a kitchen stove and counter top. They are washable and easy to fold up and put away when you are not using them. If your preschooler is a frequent visitor to Grandma’s house or lives in an apartment, it is a reasonable investment to make at $39.95 each. 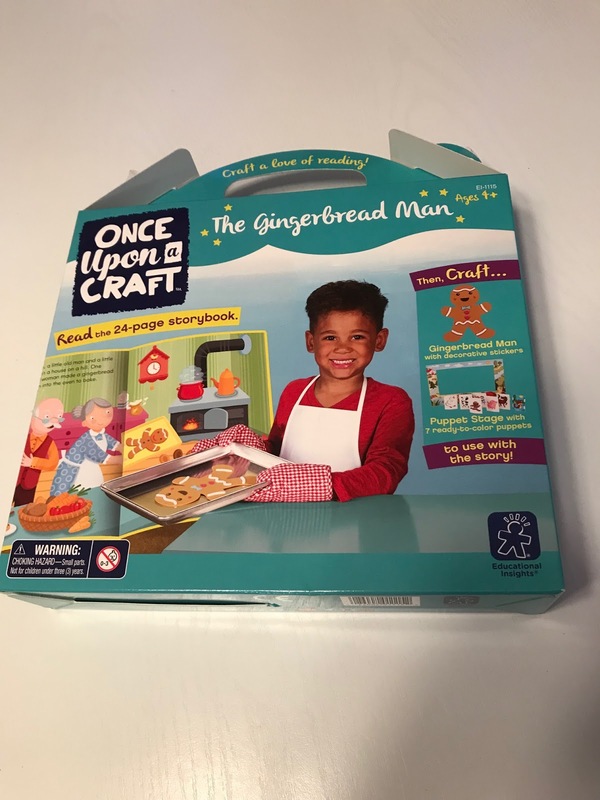 Other accessories including pots and pans, food and a chef’s outfit and tools are also available from this creative small toy company - Pop-Oh-Ver. 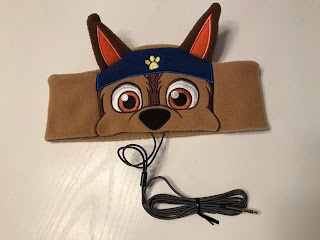 For many pre-schoolers you can’t go wrong with anything Paw Patrol themed. There is lots to choose from. Here is an item that is a little different. It is a headband with headphones inside. It provides clear, volume controlled sound. The headband is washable. 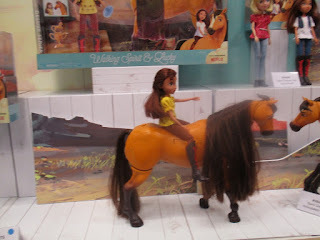 This may be one of those special items on a preschooler’s holiday list that is referred to grandparents who want to buy “that special gift.” Spirit Riding Free is a very popular Netflix series and there are many toys based on this theme. This set includes a 14.5 inch walking Spirit and 11.5 inch Lucky doll. There is sound and movement. Yes, it costs $50. Yes, she will love it. Calling all Jurassic World fans. 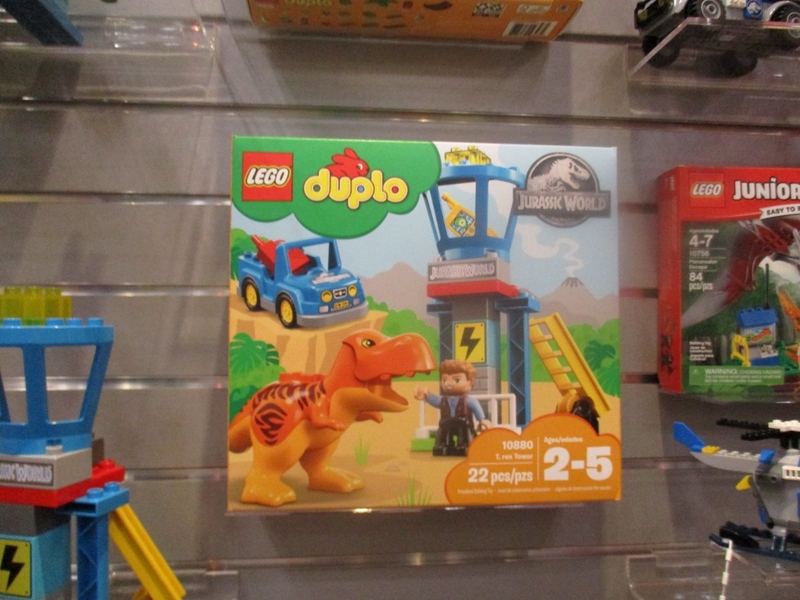 This set includes a T.rex lookout tower, a car, Owen Grady figure, a T Rex and other accessory pieces. 22 pieces in total. This DUPLO set is great for all dinosaur lovers – not just the Jurassic fans. The new holiday Grinch movie debuts on November 9th and will be heavily advertised. 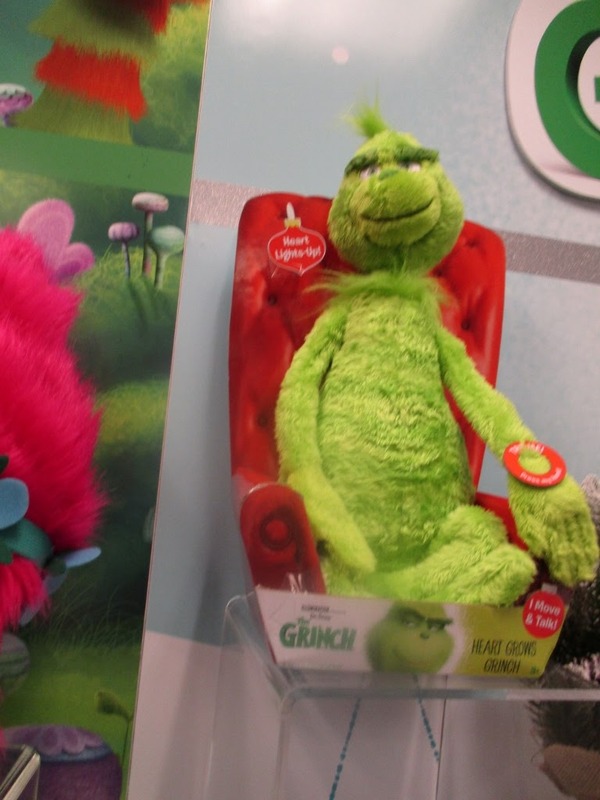 If the grandkids see and love the movie you may want to spring for this extra special Grinch plush. This super soft Grinch's heart lights up, he sways to the music and says phrases from the movie. Pricey but very cute for Grinch lovers. This could easily be one of those most wanted hard to get items by Thanksgiving. 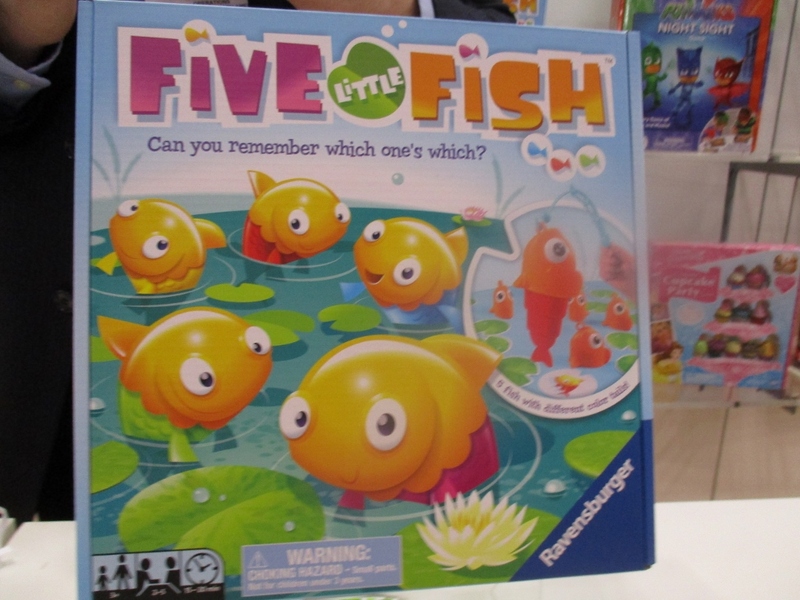 One winner will receive a Ravensburger Five Little Fish game. You can have two entries by doing both. Deadline to enter: Thursday, November 29, 2018 at midnight. This item can be sent to US addresses only. All of the items in this holiday guide can conveniently be ordered from Amazon. Just click on the icon below to go to Amazon. 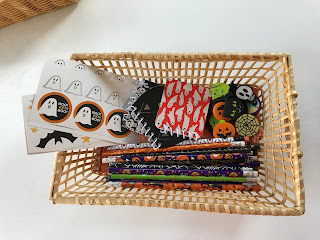 It is so simple to do and I personally have to thank Moose Toys for making trick or treating so special at my house. Our neighborhood has sidewalks and the houses are not set back very far. It is the perfect trick or treating neighborhood and people drive to come here on Halloween. So we are always prepared for a large crowd. This year we were also treated to a mild weather, clear evening so our door was open and no one even had to ring a bell. Moose Toys made our place the “go to” house on the block. Moose supports the Teal Pumpkin Project and provided me with single pack samples of Happy Places, Doorables, Pikmi Pops and Grosser Gang. 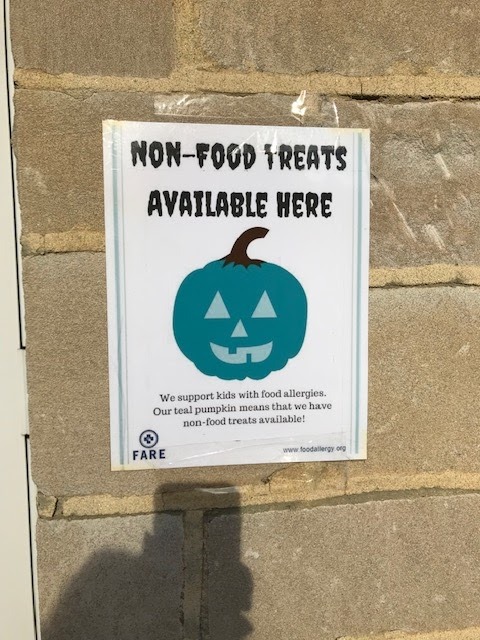 These were such a hit! So here is how I was set up for kids of all ages. I had containers to offer depending on age. For preschoolers – party size playdough or stickers. Parents LOVE this that you have something other than candy for their little one. For the 4 to 8 year olds – All the Moose surprise packs are an amazing hit. They actually send their friends to make sure they come to our house. For older kids, teens and the occasional dressed up adult - Halloween themed pencils, erasers, notepads and stickers. Yes the stickers are popular even with the teens. The little ones got the pumpkins and candy corn and the older ones got ghosts and bats. Helping me with all this was my grandson after he completed his own trick or treating. 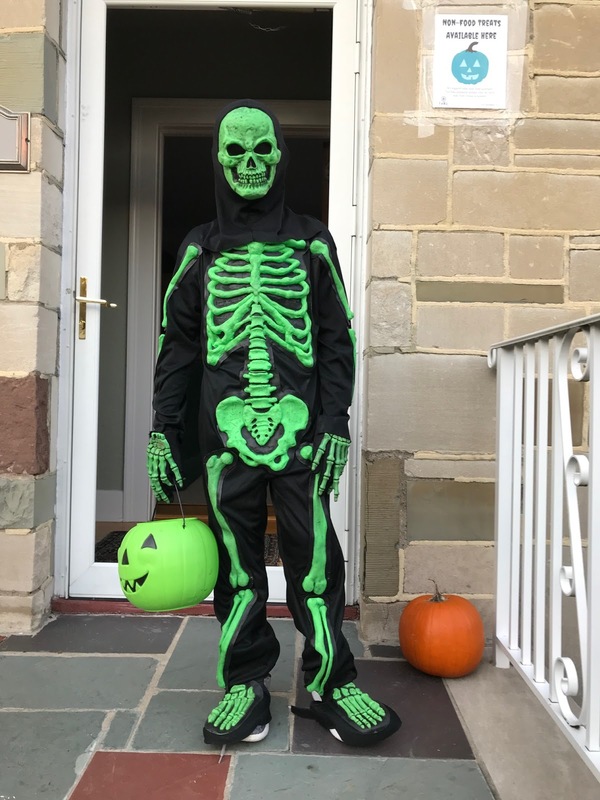 He took off this great costume before he got to work welcoming kids of all ages for a perfect Halloween treat. The Moose surprise packs also make great stocking stuffers and party bag gifts.